It’s back-to-school season! Returning to an academic calendar means keeping track of school events, class schedules, assignments, homework, and extracurricular activities. Parents need to keep track of school hours and transportation arrangements. Teachers need to make lesson plans and keep track of holidays, field trips, and testing schedules. And students, of course, need to get to class on time, keep track of assignments, and have adequate time for studying and homework. Teamup is a different kind of calendar. It’s designed to make sharing your calendar easy and secure. It’s easy to use as a group. All you need to do is set up a calendar, allocate access to your team (your family, your students, your carpool group, etc.) and let them update as needed and stay informed of updates made by the group. It’s easy to share. Maybe you don’t need multiple people inputting items onto the calendar, but you do need to easily share what you’ve scheduled. 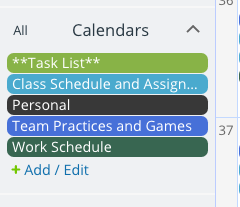 With all the sharing options built into Teamup, you can share an event or an entire calendar with anyone. It’s simple. You don’t need a user account or login to create a Teamup calendar or to access a shared event or calendar. All you need to access a Teamup Calendar is a calendar link. User accounts are available, and they add some neat features, but they aren’t necessary. Create a new calendar. The basic plan is free and includes up to 8 sub-calendars. Set up your sub-calendars. You can organize them in folders. Create calendar links to share your entire calendar or selected sub-calendars with anyone. Use the Share menu on any calendar event to share it as a webpage, via email, or on social media. For parents, a Teamup calendar can work as a master schedule point to keep track of everything: school schedules, work schedules, menu planning, family activities, and more. Put sub-calendars into folders to keep them organized. 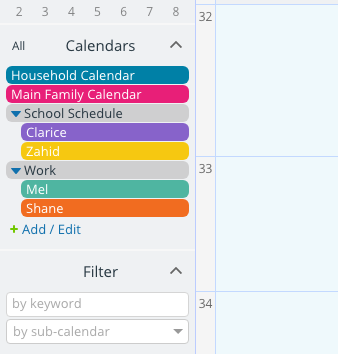 Create a calendar link with modify permission for Mel so she can input her own work schedule, add chores and meals to the household calendar, and add events to the Main Family Calendar. Create a read-only calendar link for Zahid so he can see the school schedule and family calendar, but can’t accidentally change or delete a calendar item. Create a calendar link for Clarice, who’s older, so she can modify her own school schedule and have add-only access to the family calendar and read-only access to the household calendar. Create a calendar link sharing the kids’ school schedules to coordinate custody arrangements with co-parents. Add repeating events for household chores and school drop-off and pick-up times. Add events for planned activities like field trips, school holidays, family trips or social activities, travel for work, and so on. Use the “Share as page” option to invite friends and family to Zahid’s recital, Clarice’s soccer tournament, or a holiday meal. You can also import calendar feeds, so you can view all the scheduling information you need in one place. Or you can share a sub-calendar as an outbound iCalendar feed with another person or group, giving them a way to view your shared schedule (as read-only) in their preferred calendar service. Share an outbound iCalendar feed of the school schedules with caregivers or grandparents who help with school transportation or after-school childcare. Set up an inbound iCalendar feed of work projects or team schedules so you can view work commitments and deadlines within your Teamup calendar. For teachers and educators, a calendar that can keep all your lesson plans, school dates, and more in one place can be a big help. Parents, students, and staff can download the Teamup mobile apps and see the school calendar anytime, on the go. Another method for sharing a school calendar is to embed a public, read-only view into a school website or intranet. Here’s an example of an embedded calendar. Here’s how you can embed a Teamup calendar on a website. Sharing a school calendar makes it easy for all students, parents, and staff to stay aware of class times, sporting events, school holidays, and more, without the need for extra emails, newsletter, or messages. Each Teamup master calendar on the basic plan, which is free, includes up to eight sub-calendars. 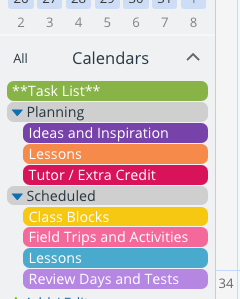 If you’ll use all of the eight sub-calendars to sort out your class schedules, assignments, school dates, etc., you can create a separate Teamup calendar for your personal/family calendar. You can save everything on your calendar, both lessons you have planned and scheduled, and lesson ideas you’re still working on. When you need to see only what’s scheduled, you can simply toggle off all the sub-calendars in the “Planning” folder. 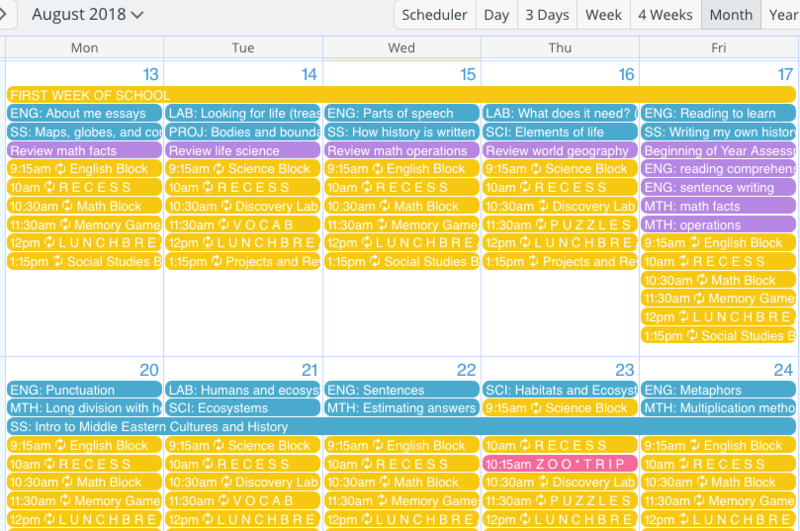 Now you have a clean view of what’s scheduled, but everything that is in Planning mode is still only a click away. Toggle the “Planning” sub-calendars off so you only see Scheduled items; turn them back on to see everything. Keep records and notes right on your calendar; you can link to files and documents, add notes of how a lesson went or whether an activity worked well or not. All the information lives on your calendar and is easy to find again: you can search by keyword, filter by sub-calendar, or go back to the date of an item to see all the notes you’ve kept on it. Use with your students to log experiments, track data, or keep records of ongoing projects. You can easily create a separate sub-calendar for that sort of activity and make it part of your teaching toolkit. Input all holidays, special events, field trips, staff meetings, and testing schedules so you can keep track of those important dates when you do the rest of your planning. Link to the resources you want to use for a lesson plan or activity; use the Description box of any event to add links, lists, notes, and more so they’re always easy to find. One feature that’s very helpful is the ability to use filters. You can filter events by sub-calendar, so you see only the events contained on the selected sub-calendar. You can also enter keywords into the keyword filter to find certain types of calendar items. If you use consistent headings and abbreviations, keywords make it very easy to find all your lesson plans for social studies, for example. You can also combine these two methods, and filter for certain keywords only on selected sub-calendar; for example, you could search by keyword “geography” on your “Scheduled > Lessons” sub-calendar to see scheduled lessons for geography. Students young and old can benefit from Teamup calendars, too. For younger students, parents or caregivers can input–or help students input–their homework assignments and test dates, plus field trips and holidays. Students benefit from having some autonomy and feel more secure when they know what’s planned and feel part of the process. Create sub-calendars that make sense for your life. 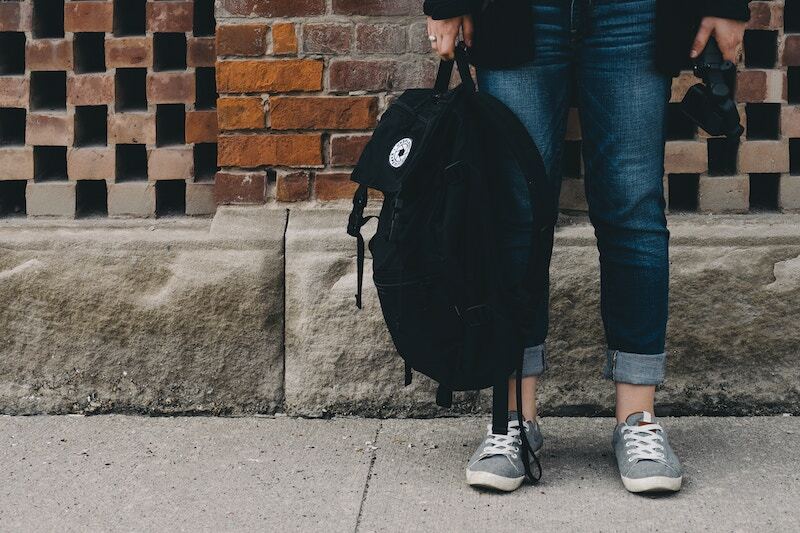 For busy students juggling a part-time job, a full academic schedule, and participation in sports or other extracurricular activities, an organized calendar is a way to keep the chaos at bay. Input everything you need to remember instead of depending on scraps of paper or notes on your phone. Schedule everything you need to remember so you don’t miss anything important. Use Teamup’s sharing options to share events, or set up a read-only calendar link to share your work schedule with parents, and reduce those “What’s your schedule?” and “When will you be home?” questions that come via text or email. Input all assignment due dates, required reading, reviews, and test days so you don’t get caught by surprise or miss an important class day. Create timelines for projects, big papers, or study sessions for major tests so you don’t get overloaded with all the work right before a deadline. Coordinate study groups with a shared calendar. Keep track of your work schedule, school schedule, and personal activities so you avoid double-booking yourself. The yearly view on Teamup is really helpful for students who need to do long-term planning. You can set the number of months you want to see at one time, from 1 to 12, and get a high-level view of your commitments. Seeing an entire semester, quarter, or year at one time can help you make better plans for travel, starting a job, or other big moves in life. To get started with your back-to-school organization and planning, click here to create a free Teamup calendar.